1988; 325 pages. Genre : Murder Mystery. Made into a movie for the PBS series Mystery!. Overall Rating : B-. An anthropologist vanishes among Anasazi ruins. A flatbed trailer and backhoe are stolen. Three murders rock the remote 4-Corners area of the Southwest. Navajo Tribal police lieutenant Joe Leaphorn and officer Jim Chee have to find the connection in all this, find the killer(s), and find the missing anthropologist. The list of suspects are all "gray"; none jump out as the obvious bad guys. The solving of the case comes from dogged and determined detective work, not from some too-good-to-be-true stroke of luck. Hillerman uses real-world settings, usually in the Native American regions in the Southwest. Since I live in Phoenix, this was a close-to-home story. He also focuses heavily on the daily lives of the Native Americans, and their sturggle to maintain their cultural identity. Chee and Leaphorn are a nice study in contrasts. Leaphorn is modernized - Navajo traditions don't bother him, and he doesn't believe in witches. Chee is a "singer" - kind of a junior shaman for his clan. Finding bodies calls for a ritualistic cleansing just as soon as the policework is done. That being said, there is a bit too much emphasis on the cultural issues here. A bit more time might have been spent on smoothing out the storyline. The ending seems contrived and just a bit abrupt. Oh yeah, and we have yet another burnt-out cop here (Leaphorn). Is it too much to ask just once to have the main cop be well-adjusted and happy to go to work each day? I have a feeling this is a tough genre to write. Somebody gets killed early on. Somebody else spends most of the book searching for clues and trying not to be offed or fired as he/she closes in on solving the case. At the end, there needs to be an exciting climax, with the perpetrators getting their just desserts. There's not much room for variation in this format, and how many thousands of murder-mystery books are there out there? 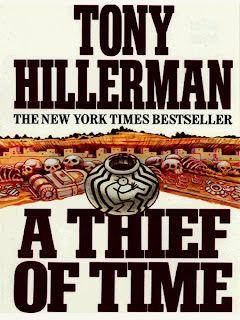 Tony Hillerman put his unique stamp on the murder-mystery format by imbuing his books with a heavy dose of Southwestern Native American history & culture. I've read that among the Hopis, Navajos, etc., he is held in high esteem for this. Tony Hillerman passed away last October 26, at the age of 83. While I'm not a big fan of this genre, it seemed appropriate to read one of his books. I'm not a Tony Hillerman reader, but because I do read a lot of cozies, I see the points you're making. Keeping the story fresh is difficult to do, especially when the story seems formulated. Some of the cozies I read focus too much on the main sleuth's personal life or try to get to cute with the characters. Maybe they're trying to shake the mystery world up a bit. I typically don't pick up those authors again. It would be good to have a mystery where the cop isn't disgruntled, disillusioned, and suspended/fired or on the brink of one of those actions. I think there's a humor list floating around where it states the cop has to be suspended in the movie in order to solve the case. Lt. Columbo fits the bill about being happy to go to work (even when he "complains" about his superiors coming down on him). My husband's always quick to point out the perpetrator might be able to get off on a technicality. But I remind him, it's just a show and he really should relax. TV probably isn't a good venue for a show about a disgruntled crime-solver. although i would like to see just one Murder She Wrote where Angela Lansbury is hitting the booze, chain-smoking, and griping about how all her neighbors keep killing all her other neighbors. I think TV's not a good venue because the audience would get tired of the disgruntled crime-solver. The viewer knows people aren't perfect and have off days, but to see it week in and week out would grate on their nerves. However, the police on Law & Order have been getting a little testy and I bang my head hoping they'll get back to crime-solving. I wasn't too pleased with the few episodes I saw of NYPD Blue, just too taxing on the brain cells to watch them work through their "emotions." I don't watch CSI because I know enough about forensics to know their full of BS. It's very difficult to find that good balance. Christina, have you tried NCIS? That's the only "crime" show I watch. I used to watch L&O but it got boring after awhile, probably because if you have a large enough TV package, you can watch an episode of L&O just about every hour of the day. That, and I got tired of their "ripped from the headlines" shows. come on, show some imagination, please! I think who ever writes for L&O watches Tru TV because a lot of Forensic Files cases have shown up on L&O. But it's pretty bad when the crime's so public and shows up on L&O even with the "twist." How do you resist the urge to throw something at the TV? When I first started watching NCIS, I felt the same way about the characters. If I hadn't been living with my in-laws at the time, I would have changed the channel, but it was my mother-in-law's favorite show, so I ended up watching it for about two months, and by that point, I loved the characters to death. I like them playing off each other now.